Another quicky while I’m at the BYU genealogy conference. We all know how important it is to add sources for the information we enter. 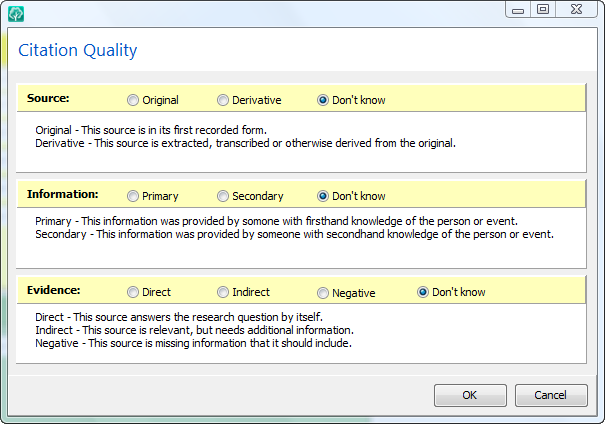 When adding a source in RootsMagic, we’ve always been able to enter the “quality” of the citation. But it has been limited to “primary”, “secondary”, “questionable”, and “unreliable”. Until now. As you can see, RootsMagic 4 now follows approved standards for evidence analysis in an easy to understand format. This isn’t the only new source enhancement coming in RootsMagic, but we’re saving the best for later. Stay tuned. Way to go Bruce! Now my excitement level has jumped a few notches. Thanks Mark. I updated the link in the post to point to the updated map you posted about an hour after I linked to it . What a great idea to further design the program around accepted genealogical concepts. Thanks Bruce for including the source enhancement, which is going to be a great help and for also referring to Mark’s great research map, which is on my wall above the computer. Looks great! I’m very pleased that you’re addressing these types of improved source-related details. Besides Mark Tucker, I also hope you’ve been in contact with Elizabeth Shown Mills during RM 4.0 development! I’m very eager to see what other source enhancements might be up your sleeve. Yes, RootsMagic will have full integration support with New FamilySearch. This is fantastic. I am currently working on my certification portfolio and these additions are just what I need!!! Thanks, Bruce! I’m really pleased to see all these exciting new features coming in the new version of RootsMagic, which is already the best genealogy software on the market. I’m sure glad I changed to your software years ago. Hi Bruce. As the citation quality screen is so different from the existing screen, what happens to the current entries (primary, secondary, etc) when I upgrade? I very much like RM and am looking forward to the upgrade. Alright, enough already. When’s it coming? One the screen image you showed, there is a misspelling.. The categories under “Evidence” for citation quality (especially “negative”) seem to not fit well. Instead of Direct, Indirect & Negative, I think Conclusive, Substantive, and Supportive would show better they quality of the particular type of evidence for the citation. Just a thought. Thanks. RM4 is following the guidelines of the Board of Certified Genealogists for citation qualities. This web page has helped me understand how they work. I went to the BCG site through the link you provided. Under their paragraph “Direct or Indirect Evidence” they don’t discuss negative evidence. Should the definition you are using be something like “Refutes the statement” rather than “the source is missing information”? […] 4 the end of March 2009.